Your participation would be appreciated to learn the history. 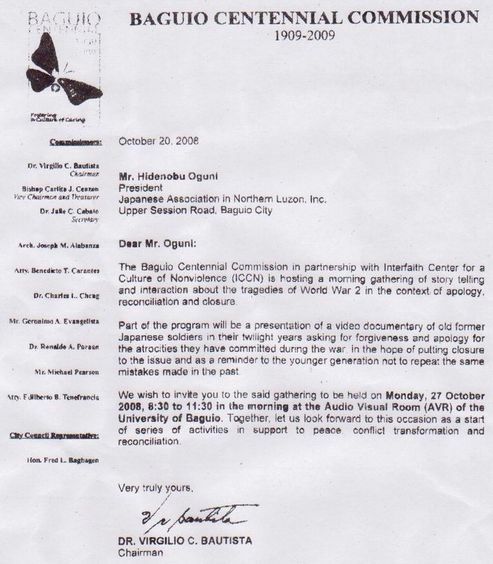 The Baguio Centennial Commission in partnership with Interfaith Center for　a Culture of Nonviolence(ICCN) is hosting a morning gathering of story telling　and interaction about the tragedies of World War 2 in the context of apology,　reconciliation and closure. former　Japanese soldiers in their twilight years asking for forgiveness and apology for　the atrocities they have committed during the war in the hope of putting closure　to the issue and as a reminder to the younger generation not to repeat the same　mistakes made in the past. We wish to invite you to the said gathering to be held on Monday, 27 October　2008, 8:30 to 11:30 in the morning at the Audio Visual Room(AVR) of the　University of Baguio. Together, let us look forward to this occasion as a start　of series of activities in support to peace conflict transformation and　reconciliation.